Bring dawn all ingredients(2) and reach 20000 points to complete the level. 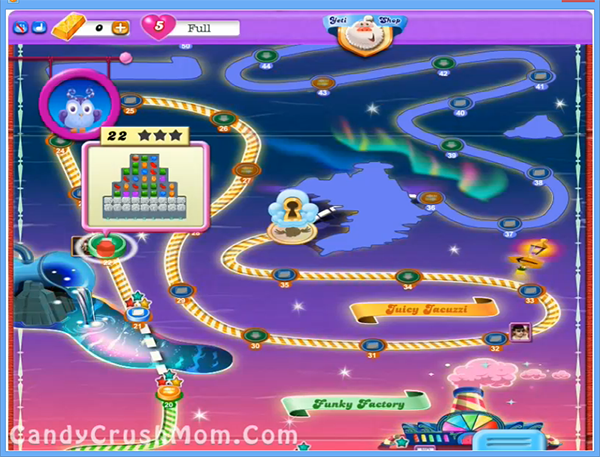 This level is again with ingredients requirement and have small 29 candies board so it wont be that hard for you to reach requirement as you already played lot of candy crush. To bring down two onion ingredients you should try to break 28 meringue blocks first so you will have more chance to make special candies and ingredients wont stuck on it later. You need to make special moves as you only have 15 moves and also don’t forget to balance Odus the owl and increase moon power to break candies. We complete this level with 52900 score within 9 moves and remaining six moves converted to striped candy that help to add some points on score board.